I have been “threatening” to replace my kids chicken tenders with something that is grain free. They have been eating organic gluten free chicken nuggets/tenders, but those still contain rice flour and corn starch ect. This was very easy to do, I just need time to try it. Yesterday I cut up free range, vegetarian chicken boneless chicken breasts into 1 inch strips and then cut them in halves and some in thirds. Ryan (age 3) helped me dip each on in egg then in another bowl full of coconut flour and salt. I then deep fried the pieces in a mini deep fryer I purchased filled with organic coconut oil. 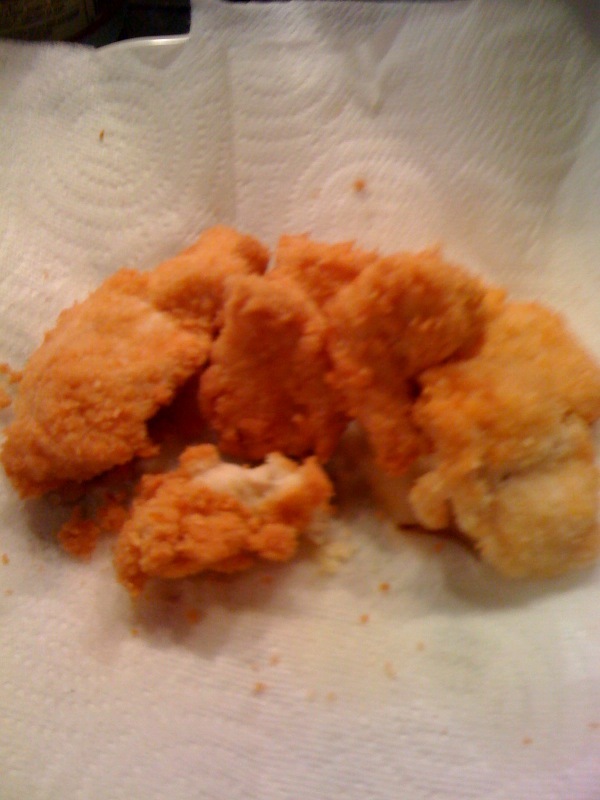 I fried the basket of pieces for 6 to 8 minutes and them put them on a plate with a paper towel to cool and drain. The KIDS LOVED THEM. I was skeptical about Collin (age 7 with autism) because he is SO picky and different tastes can be very aversive to him.BUT he loved them. Collin just started eating chicken recently. For years it was a huge turn off to him. He eats his with organic catsup and Ryan used Ken Steakhouse Honey Mustard (gluten free also). Hi! I am Christy Butch. Married to Garrett Butch and the mother of two boys, Collin and Ryan. I am the Co-Founder of Maximum Potential, a company that teaches people how to work with autistic children. I am also a Strength Coach CF-L1 Instructor and Olympic Lift Coach as well as Nutrition Certified. This blog is about the journey to drastically change my families diet to better our immediate and long term health. I am excited to see what lies in store for us, especially my 7 year old who is autistic.We are now following a diet of meat.vegetables.nuts,seeds,little starch and little sugar. This entry was posted in Kid Food and tagged Autism, checken tenders, Dairy free, Diet, gfcf chicken, gluten free. gfcf, grain free chicken, kids, lunch, organic chicken. Bookmark the permalink. 7 Responses to Gluten Free, Grain Free, Dairy Free Organic Chicken Tenders! Wooohooo! Do you sell frozen, by the case? Great idea! BUT I can barely keep my family with a supply! 3 boys ALWAYS eating. whew! I tried these today, and I LOVED them!!! My kids did not:( We are on the GAPS diet, and they are really struggling finding food to like. I’m hoping it will grow on them. Thanks for the recipe!! Maybe try some other flours like almond or arrowroot and change up the spices like add paprika and take away garlic. You could try frying in another oil like olive or grapeseed. Maybe a certain condiment they really love would help too. I’m going to read more about GAPS. It may be close to what I do already but maybe I’m missing something and it could help my son with Autism. GAPS has really helped immensely with my son. He’s no longer taking his medicine, he’s actually interacting with people, he went from about six meltdowns a day, to maybe once a week. He is actually playing WITH other children, and sometimes he even goes along with their ideas. I can’t praise GAPS enough! Basically GAPS is a grain free, sugar free diet with absolutely no processed foods, and with probiotics. At first it’s also dairy free. We’ve been on it for 35 days, and we have yet to introduce dairy, except for clarified butter. It’s not so much that he’s intolerant of diary, but the diet calls for raw milk, and it’s just hard to get a hold of around here. You also make your own yogurt and kefir, and I’m already spending so much time in the kitchen. GAPS is about healing the gut, because the gut immensely contributes to our overall health. Olive oil is out, because cooking in it changes it to an unhealthy food. I haven’t heard of arrowroot, but I will try almond flour. I’m not sure if grapeseed oil is a legal food on GAPS diet. I’ll have to check into that. I didn’t add any paprika though, and they did have homemade ketchup to eat with it. Thanks for your response Christy!